Many people close credit accounts they no longer want, thinking that the account will automatically be removed from their credit report. Unfortunately, that's not the case. Your credit report contains a history of your credit accounts, both open and closed, so closing an account won't automatically erase it from your credit records. What Happens When You Close an Account? When you close an account, the account status on your credit report simply gets updated to show that the account has been closed. If you're still making payments on an outstanding balance, your monthly payment history will also continue to be updated each month to reflect the timeliness of your payments. In some cases, a closed account can work against you, especially if the account was closed with a delinquency and reflects negatively on your credit report. In this scenario, if you could remove the account from your credit report, your credit history would likely improve. Removing a closed account from your credit report isn't always easy, and you can only remove them from your credit report in certain situations, but you can still get these accounts removed in some cases. If the account on your credit report is actually open but incorrectly reported as closed, you can use the credit report dispute process to have it listed as an open account. Having a credit account reported as closed (when it's actually open) could be hurting your credit score, especially if the credit card has a balance. You can dispute any other inaccurate information regarding the closed account, like payments that were reported as late that were actually paid on time. You can use a goodwill letter to request a creditor remove a closed, paid account from your credit report. Creditors don't have to give in to your request, no matter how nicely you ask, but you may get lucky and find a creditor who's sympathetic to your request. 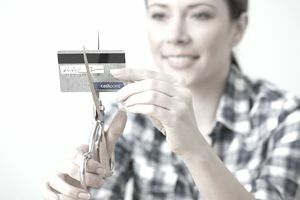 For accounts with balances, the "pay for delete" strategy can help you remove a closed account from your credit report. The pay-for-delete letter offers payment of the account in exchange for removing it from your credit report. Again, creditors don't have to comply, but occasionally some creditors and debt collectors agree to the arrangement. You can send your goodwill or inquiry letter to credit bureaus through the mail, their online website, or in some cases, by contacting the credit bureau by telephone. If you choose not to take steps to remove closed accounts, you'll be happy to hear that these closed accounts won't stay on your credit report forever. Depending on the age and status of the account, it may be close to dropping off your credit report for good. If that's the case, all you have to do is wait a few months for your credit report to update. Most negative information can only be listed on your credit report for seven years. If the closed account includes negative information that's older than seven years, you can use the credit report dispute process to remove the account from your credit report. No law exists that requires credit bureaus to remove a closed account that's accurately reported, verifiable and doesn't contain any old, negative information. Instead, the account will likely remain on your credit report for ten years or whatever time period the credit bureau has set for reporting closed accounts. Don't worry, these types of accounts typically don't hurt your credit score as long as they have a zero balance.